Munising is well known for its hospitality and wide variety of great hotels, motels, resorts, and cabins. Let us help you select the lodging that will accommodate your Upper Michigan vacation plans. We invite you to join us in the middle of Michigan's Upper Peninsula for a fun, friendly, relaxing, and family orientated vacation. 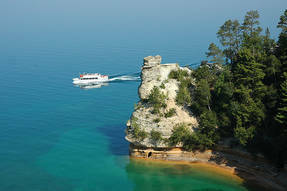 Enjoy The Pictured Rocks National Lakeshore, historic lighthouses, waterfalls, tours, and more year-round!